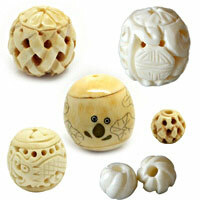 Polymer Clay Beads--Polymer clay is made from polyvinyl chloride and is pliable and bendable. Polymer clay is man-made and from children to adults, everybody can use the polymer clay to make beaded jewelry. Polymer clay beads are colorful, unique and less expensive for use in jewelry or to decorate boxes and frames. They are a good choice for people who want to make funky jewelry. Welcome to order some from us. NOTE: Our Min. order is for each color each size. China beads accept OEM/special orders. Contact us now!